Client's Request: … Visiting the Master Gardener Help Desk at our new relocated offices @ 2380 Bisso Lane in Concord… I found these spiders in my home … Although I know that they aren't normally found in California (e.g., see spiders.ucr.edu/myth.html), I think that they are Brown Recluse Spiders! Help Desk Response: Thank you for bringing your spiders in to the UC Master Gardener Program Help Desk. These are not Brown Recluse Spiders, although I would agree they look somewhat similar. We have identified them as Yellow Sac Spiders, (Cheiracanthium species). Here is a photo of this spider. The eye pattern is one of the main keys to identification: your specimens have eight eyes whereas the brown recluse only has six. 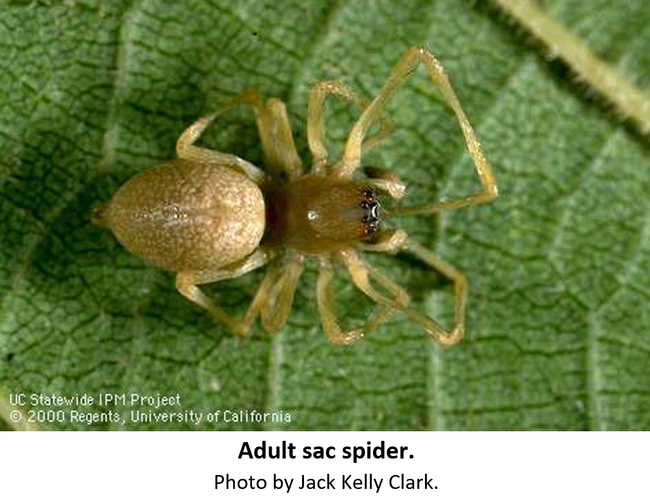 Yellow sac spiders do sometimes bite if picked up or trapped by clothing, although most people do not experience a bad reaction. You can also find information in the Pest Note on how to manage them. Because spiders are beneficial in the environment, you might consider catching the ones you see and releasing them outside; vacuuming up the spiders and any webs is also quite effective. The bites you have experienced may or may not be caused by the spiders, and I hope that you will not have further problems with this.